31 Days of Halloween '17 - Day 21 - "Annabelle: Creation"
I was glad to see the first film even get a sequel after the seemingly "meh" reaction to it upon release. But apparently it gained enough steam in the meantime to warrant a sequel. I've been hearing about this film for quite a while because one of the actor's is a friend of the family. I don't know her personally but apparently my mom does and has been sure to let me know everything she knew about Samara's experience on it. Despite myself having zero actual connection to the girl, it's still cool to "know" of someone that's in the film. It's even better when the movie is actually good. I was a little worried at first, as the film's slow pace threw me off, but ultimately the film really satisfied. It's scares, while a little repetitive, were aplenty. And it provided more than enough creepy moments to leave me happy. Lulu Wilson needs to just be cast in every horror film that requires a little girl because she always just knocks it out of the park. Talitha Bateman also gave a great performance, coming out of nowhere and providing another actress to look forward to in the coming years. This is one of the better horror films of the year and one of the better possession films we've seen since The Exorcist, sitting comfortably alongside its cohorts, The Conjuring and Insidious. 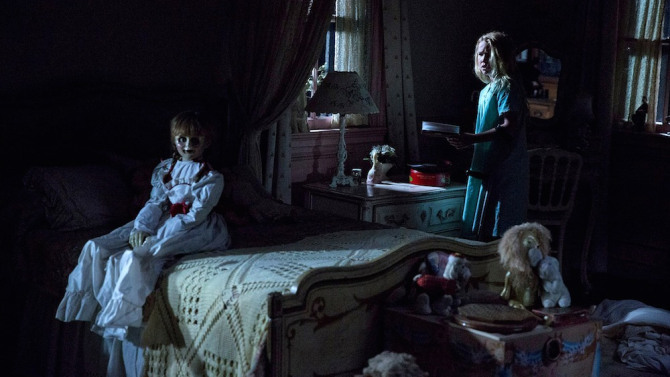 I was hoping with how it was being set up at the end that we may get some more films but it seems as though the Annabelle saga is complete. Thankfully the Ed and Lorraine Warren Files provide plenty of great material.